Why are we still here? Why do we continue to log on night after night, running the same missions, shooting the same guns, using the same abilities, all in the same places? It’s the simplest of all answers: it’s fun. Amidst the randomness, the monotony, the grinding, the poor developer communication and design decisions, Destiny is still one this one thing above all else, and I believe Destiny will continue to be fun far into the foreseeable future. However, any Guardian worth their salt knows that fun only scratches the surface. We have to take our spoons and dig deeper, into the game’s core. Destiny is a slot machine. At least, that’s what its critics will have you believe. Are they wrong? Well, no. Destiny is a sort of glorified slot machine when it comes to getting new and (sometimes) better guns and gear. Want that Crota’s End raid helmet? You’re gonna have to defeat Crota. How many times? Who knows! I got mine on my second kill, but technically, I could’ve run the raid with 3 warlocks every week for months and never seen it drop. Same goes for getting the all-so-legendary (get it?) 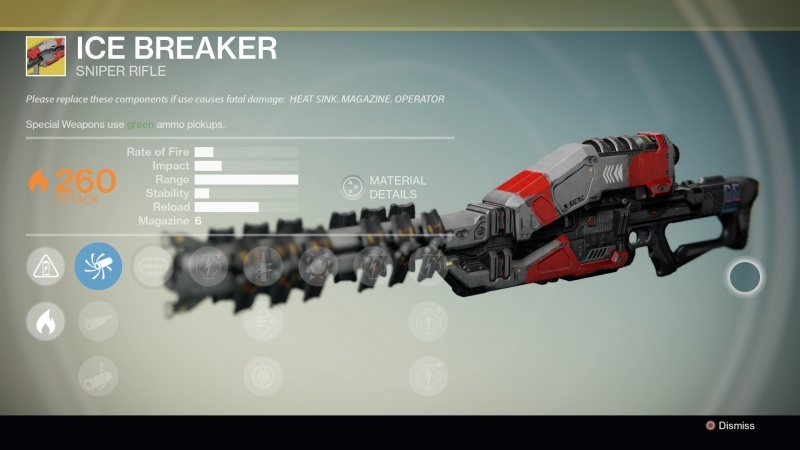 exotics Icebreaker and Gjallarhorn, along with any other cool gun or piece of gear you might want. Except with exotics, it’s even more random. Gjallarhorn has just as good a chance of being dropped for that 1-16 potato in the Crucible as it does for that 43-3 monster who lead his team to victory. 0.63 K/D? Here’s an exotic! It has the same chance of being dropped in the Vanguard ROC strike playlist, and of being looted from Deathsinger, and of being dropped in a Nightfall, and of pooping out of a decrypted legendary heavy weapon engram, or it could even be sold by Xur on a weekend to come! Who knows when Gjallarhorn, or Icebreaker, or Obsidian Mind, or Radiant Dance Machines (things I want) will make its appearance. But that’s just it…who knows? This is what keeps us playing, keeps us coming back for more. This is the reason we overlook the nonexistent story, the monotony of daily missions and bounties, the lack of strikes and raid content…we play because we must. At last, the ice is broken. Now, I play the game enough to have become complacent with this RNG-based system. Put in enough time, and you’ll see the rewards…eventually. I’ve put in my time, and I’ve seen my rewards. But what about those without time? I’m 22 with a day job. What about those with careers and families who may only get a few spare hours a week? With 4 level 32’s at Spoon Deep, it’s easy to forget that well over 90% of the Destiny player base has never even completed a raid, let alone with 3 characters a week like us here (hell, sometimes we even get all 3 done on Tuesday night! Crota’s End Hard Mode, on the other hand, is a different beast entirely. Let’s not get into that here). Now, as stated, most Guardians haven’t played high-end content. Personally, I don’t mind. Do I want more people to experience the joy of seeing their favorite exotic drop from a raid chest, raid boss, or Nightfall? Of course I do. And they can! 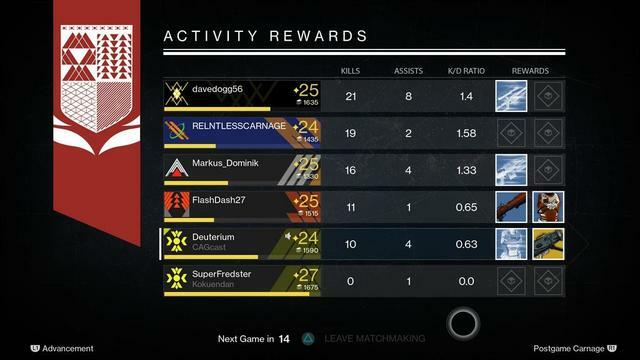 I just have a better chance (except I just deleted my second warlock to start a brand new Striker Titan, so no more!). But I don’t mind this either because being level 32 with a raid helmet, Heart of the Praxic Fire, and SUROS makes me feel just a little bit more unique in a world where everyone wears the same armor and wields the same weapons as everyone else. I’ll be discussing the idea of a wardrobe system in a post to come. But the point is: Destiny is a slot machine. We log on night after night just to pull the lever once more, our only input being time. When we win, we scream, yell, and celebrate. When we lose, we curse those who won. But the thing about randomness is this: it’s random. By the laws of probability, my three Nightfall runs tonight could drop 3 Gjallarhorns. I could pull 3 Gjallarhorns from Deathsinger, and Crota could drop 3 Gjallarhorns as well. That’s 9, and in one night! Very, very, very, very, very, very, extremely unlikely. But possible. The same laws apply to our own universe as well. Quantum mechanics tells us that by technicality, my arm could pass right through the table it’s resting on right now, this very second. The chances are infinitesimally small, almost literally 0, but the probability is there. It exists. And this is cool.